Why Ship to South Korea? What can I send to South Korea? What items are restricted? A number of fun outdoor activities can be enjoyed in South Korea, such as windsurfing on the Hangang River or hiking in the mountainous regions. If you want to take part in outdoor activities but want to avoid hiring equipment when you are there, you can use the services of Send My Bag to ship your own equipment to South Korea. You may be going to South Korea for an extended period of time, in which case you need to bring numerous items to make your stay possible. Send My Bag can ship your items for you, allowing you to bring all the clothes and books you need, while saving you the embarrassment of excess baggage fees from your airline. Our service is also great for international students studying for their degree in South Korea or for those planning to spend a year abroad or gap year in South Korea. Send My Bag can help students quickly set up home in South Korea by shipping their possessions, including clothes, books and DVDs. If you are enjoying a city break or an activity holiday in South Korea, or if you are moving there permanently, you can save yourself a lot of stress by sending your possessions with Send My Bag. Your possessions will be looked after for you, allowing you to get on with exploring your new environment. Send My Bag will pick up your bags at home and deliver them to your final destination in South Korea. You can send as much as 30 kg per bag, which means that you can bring all your home comforts with you to help you set up home abroad or to fully enjoy your holiday. To find out more about sending luggage to South Korea, visit our ‘How it works’ page, or our ‘FAQs’. Cycling is becoming more popular in South Korea, with the government running a scheme to get Koreans cycling. There are 1,757km of river cycle paths, alone, making South Korean a happy prospect for cyclers. Why not ship your bike to South Korea with Send My bag and enjoy the South Korean scenery from the comfort of your own bike. By sending your bike you can avoid exceptional baggage fees from your airline and save yourself the hassle of carrying a heavy bike to and from the airport. To find out more about shipping your bike, read our bike shipping page, where you can learn how to best package your bike for safe transport. South Korea has around 200 golf courses – so plenty for golfers to choose from. The top-rated courses include the South Cape Owner’s Club, Nine Bridges, and the Anyang Country Club. Why not try some of these golf courses while you are in South Korea using your own golf clubs by sending them with Send My Bag? Make sure you find out how best to prepare your golf clubs for transit by visiting Send My Bag's page on sending golf clubs. You may not be aware, but South Korea has numerous ski resorts. In fact, the country will be host to the Winter Olympics in 2018. Some of the best resorts include Yongpyong Resort, Phoenix Park and Vivaldi Park. Why not try South Korea for your next ski holiday and send your skis ahead to South Korea so that you don’t have to rent any equipment when you are there. Read more on ski shipping here and discover how best to package your skis for transit. If you moving to South Korea permanently, you will have to do some research into international removals to South Korea in order to move all of your possessions. Make sure you choose a reputable removal company and ensure that all your items are carefully packaged so that they won’t get damaged in transit. Use appropriate packaging for your items and seal everything up well. South Korea is a popular destination for international students, with top universities such as Seoul National University, Korea Advanced Institute of Science & Technology and Pohang University of Science and Technology. If you fancy studying in South Korea you can easily send your possessions with Send My Bag, which allows you to bring so much more than you could check into an airplane hold – so all the books, writing materials and clothes you might need. Find out more about student shipping and how to receive your student discount by visiting our student removals page. You could send a parcel to South Korea with Send My Bag, which is particularly handy if you only need to send a small number of items. Friends and family at home can use this service to send things to you in South Korea, such as gifts or care packages. Make sure you choose a good solid box when sending a parcel to South Korea and tape it up well so nothing gets damaged in transit. Also make sure you know about rules regarding personal effects and brand new items (see below). Take a look at our information page on how to send a parcel, to find out what you can send with Send My Bag and how to package your items. When sending big bulky items, such as a sofa or a wardrobe, to South Korea you could try using air freight. Air freight usually takes one to two days, which is normally faster than sea freight shipping, but generally more expensive. What you have to pay will depend on the weight and size of your shipment. You will probably also have to use the services of a customs agent to handle customs clearance. And, you need to work out how to get your items to and from the airport, which means that costs could quickly mount up. If you send internationally by air freight to South Korea your items will likely arrive at one of the major international airports, such as Gimpo, Muan or Gimhae Airports. You could try sea freight or container shipping to transport your possessions to South Korea. Sea freight usually means shipping items in large containers loaded onto cargo ships, so is also good for bulky items, like a stove or dining table. It can be less expensive than air freight, but you will still need to use the services of a customs agent and will need to sort out how to get your items to and from the ports, which means it could cost more than expected. When using container shipping to South Korea your items will most likely arrive by ship at a major sea port, such as Busan or Incheon. Excellent and much valued service. Used Send My Bag to send a care package to my sister who has recently moved to South Korea. Can’t fault Send My Bag in anyway. Took a little long on the other side to get the bag cleared - but that was to be expected! Have used Send My Bag on numerous occasions throughout university as well and find it a highly valuable and easy service! Without Send My Bag we wouldn’t have been able to get belongings to and from Uni or all away across to South Korea! Customers are currently limited to a maximum declared value of $150 USD / £90 / 130€ / $205 AUD for shipments entering South Korea, in order to avoid delays with customs clearance and additional duty and taxes. Korean citizens may be required to obtain a Personal Customs Clearance Code from customs authorities in South Korea in order to import used personal or household goods. Non-Korean citizens may be required to submit a copy of their passport and their entry ticket issued on arrival in the country, in order for customs clearance to be completed. When visiting South Korea, you must spend some time in one of the national parks, such as Seoraksan or Bukhansan National Parks, with the latter offering great views of Seoul. You can go hiking or even rock climbing in these parks. 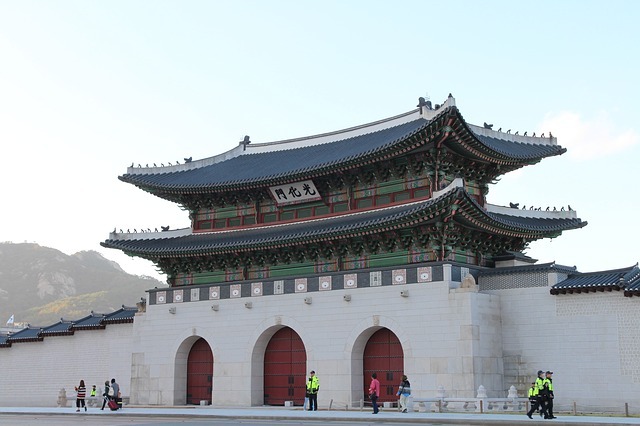 Another must-see is the palaces in Seoul, including Changdeokgung and Gyeongbokgung Palaces. Here, you can see pretty architecture, learn about Korean history, and, if you are lucky, witness the changing of the guards in their traditional costumes. If shopping in your thing, head to the Myeongdong Shopping Street in Seoul. You will find every ware you can think of here and can enjoy picking up some unusual items that you wouldn’t find back at home. Don’t forget to try out the street food while in Seoul. Spicy rice cakes, ice-cream filled waffles and cotton candy moulded into all sorts of shapes are among the treats awaiting you in Seoul.